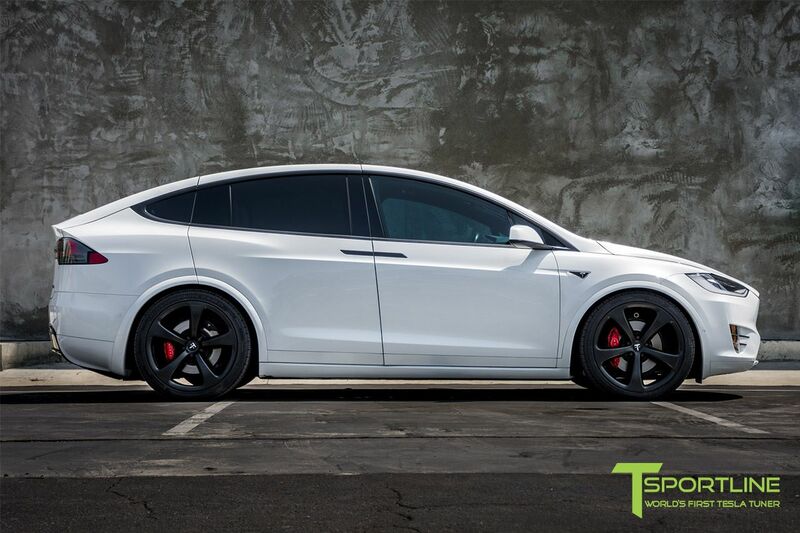 What Say You About This Pearl White Tesla Model X? 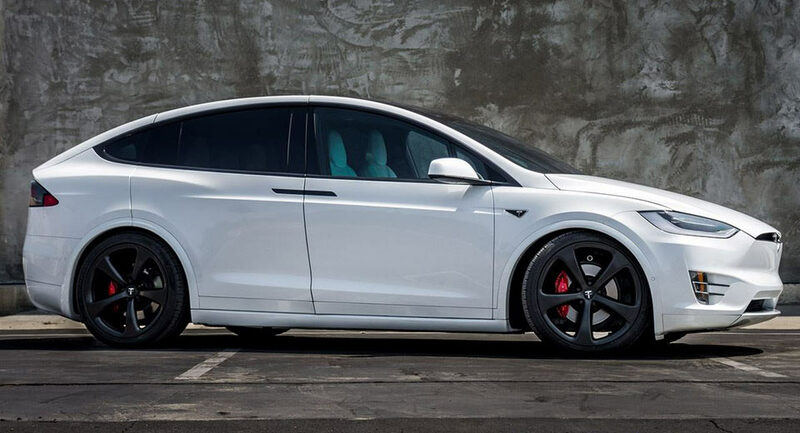 The Tesla Model X isn’t your typical SUV or even crossover in more ways than one. Some may find that refreshingly delicious, while others off-putting. To each his own. Naturally, the same applies when it comes to tuning. 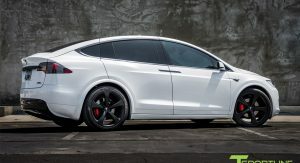 This particular Model X was styled by T Sportline, the world’s first Tesla tuner and a company that recently unveiled their latest mods for the Model S (the facelifted model, so-called 2.0). 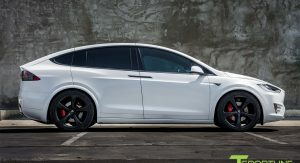 Of course, if you need a little more room for the family, the Model X should be your choice as far as Tesla is concerned, and if you can get it to look as clean as this Pearl White model, then more power to you. 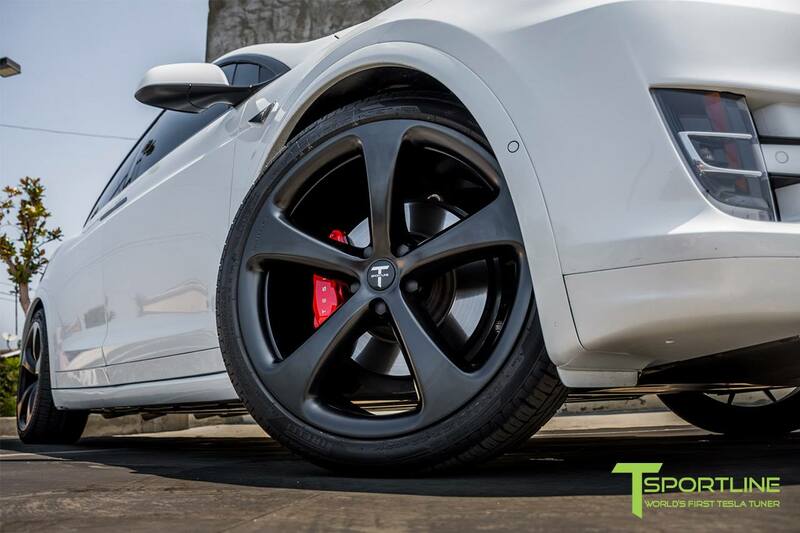 The matte black MX5 forged wheels measure 22″ front and rear, and feature a lug nut cover set painted in the same color, plus red calipers. 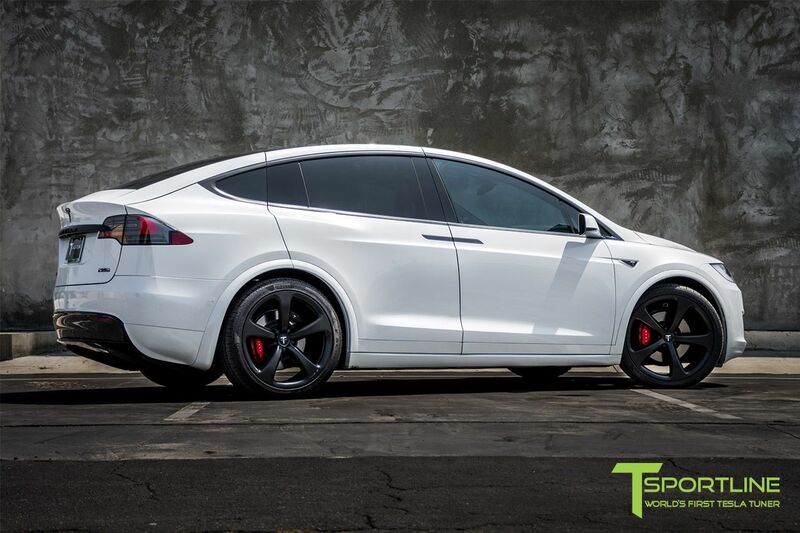 By the way, we’ve seen these wheels before on another Pearl White Model X, except those were gloss black. 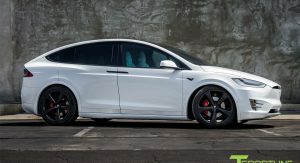 As for the interior, unfortunately we’re not given a glimpse, although it appears that the seats are white, which in turn probably means we’re dealing with a dual-tone cabin – this is a Tesla after all, where the upper dashboard and upper door panels are usually black. That’s because it’s a minivan. And the only one I would consider owning…..maybe. 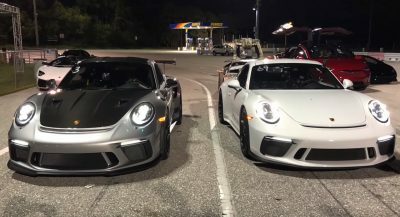 0-60 in just under 3 seconds. Has AWD. Has an adjustable height suspension. And it can easily cost over $100k. Putting it in the same category as a Sienna or a Odyssey isn’t exactly accurate. But somehow, I suspect that the owners don’t care how non-owners describe it. Of course they don’t. Doesn’t mean it isn’t a minivan/mpv. Okay. I can’t argue with that level of logic. 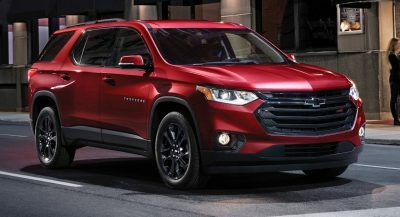 Maybe we could call it MPV coupe? Love the X. It looks good in white. 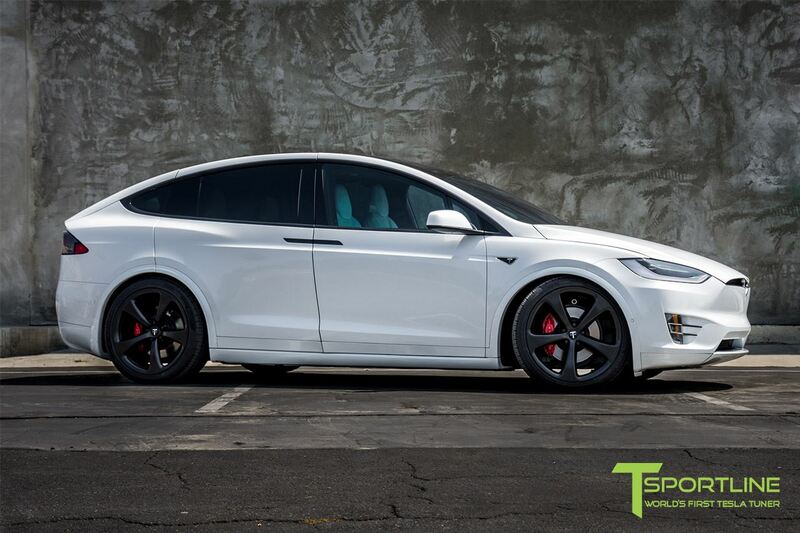 Though it’s insane that Tesla charges a $1500 premium for white. Not a fan of pure black wheels. They look hooptie. Gunmetal grey would be better. I’ve always liked the Model X, sure it’s bulbous AF, but I still get a little excited when I see them out and about. 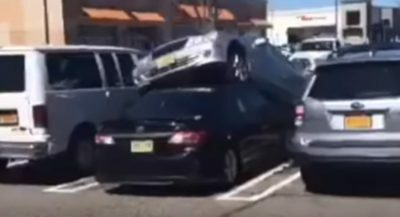 Odd car. Cool car, but odd car. Don’t think it’ll age all too well. its a FAST fat heavy turd. pretty sure the battery pack a lone is like 1000 lbs, or close to it. to your point, i agree, it wont age well. What do I say about this article? and haters like you always gonna h…. i kid i kid. The design inspiration of an egg… U G L Y! Nothing with that little ground clearance should ever be considered a SUV. 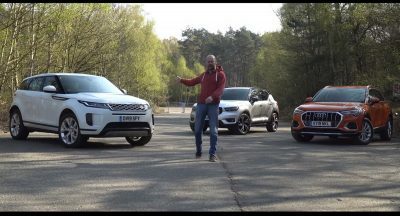 Previous PostPrevious Is The Range Rover Evoque Convertible Really Pointless?